The Nike Air Force 1 Roc-A-Fella returned as part of the Nike AF100 Collection that debuted at ComplexCon 2017. Nike is now set to give the iconic Nike Air Force 1 a wider release at the end of November. Originally released in 2007, the sneakers were created for members of the Roc-A-Fella label. Featuring an all-White premium leather upper paired with the Roc-A-Fella logos on the side panel, tongue and insole. 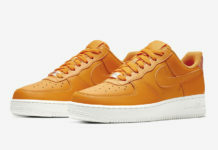 Look for the Nike Air Force 1 ’07 “Roc-A-Fella” to release on November 30th at select Nike retailers and Nike.com. The retail price tag is set at $150 USD. UPDATE: Roc-A-Fella’s Nike Air Force 1 Low is set to have a wider release this Thursday at select shops like Livestock.